At the top of the picture is a sign that says “Singapore Sign School for the Deaf”. Above the English words are Chinese characters. The people in the photo below the sign make up a class of Deaf students. Some are sitting and others are standing. I vividly recall the summer of 2016. I attended the Singapore National Deaf Youth Camp that occurred from May 20 to 22, 2016 as part of my 7-week internship at the Singapore Association for the Deaf (SADeaf). Through observations and my interactions with the camp participants, I realized that a hybrid of different languages and manual communication systems were being used by different individuals in Singapore to communicate with one another. These included Singapore Sign Language (SgSL), American Sign Language (ASL), Pidgin Signed English (PSE), Signing Exact English II (SEE-II) and spoken English. It was all very fascinating to observe. One of the sessions scheduled in the camp programme which aroused my curiosity was the SgSL versus SEE-II debate. Although I have heard that there are still debates between the exact manual representations of the grammar of the spoken language which is akin to SEE-II, and the national sign language happening in various parts of the world, I had never personally encountered anything like it before in any of the Deaf camps and workshops I had attended while living abroad. At the camp, participants were divided into the group they supported and they were given opportunities to debate their position. The quote at the start of this essay introduced the fundamental arguments of each side. As I reflected further, I began to see that this debate was connected to my life, and to fundamental issues of being d/Deaf in Singapore. Using my own lived experiences as a way to think about these issues, I examine what this history means, and argue that being Deaf is a reflection of the need to identify with Deaf culture and with sign language. Deaf Studies as a field of study is concerned with the experiences of the Deaf. It grew out of the Deaf Rights Movement historically and focuses on the experiences of Deaf people, Deaf history and Deaf culture (Myers & Fernandes, 2010). Within the Deaf community, there is a distinction made between being “deaf” and being “Deaf”. Being deaf refers to the medical condition of not being able to hear or having hearing loss, while being “Deaf” refers to one’s identity and affinity with the Deaf community, usage of sign language, and Deaf culture. Members of the Deaf community have different degrees of hearing loss ranging from mild to profound levels. In this vein, I have a confession to make. I never used to identify as “Deaf” or even “deaf”. Since young, I have unknowingly categorically rejected the identity of being d/Deaf. The reason for this is simple. I had no idea that the word “Deaf” even existed. It was beyond my realm of experience. As for “deaf”, I thought it strange to label myself that, when I could hear conversations relatively well depending on the situation. I also have intelligible speech. To 8-year-old me, “deaf” meant that I could not hear completely nor speak at all. It just didn’t make sense for me to identify as “deaf”. Instead, I referred to myself as “hearing impaired”. At other times, I would say that I was “partially deaf” or “hard-of-hearing”. I used the term “hearing impaired” during my childhood and teenage years also because it was a term that was imposed on me by my audiologist, my parents, and my teachers at the Canossian School for the Hearing Impaired and St Anthony’s Canossian Primary School. I knew no other more appropriate term to label myself. It also appeared to be the most fitting term to describe myself to other people at that time because people generally understood it as someone with a certain degree of hearing loss with some speech ability. To me and the people around me, the term “deaf” was more degrading than “hearing impaired”. In other words, there is a stigma with being “deaf”. Thus, I never identified as part of the Deaf community in Singapore during my growing up years. My first contact with any form of signing occurred when my mum brought me to Wesley Methodist Church in 2000 as she had heard that they had a Ministry of the Hearing Impaired (MHI). When I walked into the church service one Sunday morning, I saw someone on stage moving her hands about in sync with the song. A number of people with hearing aids just like me sat in rows on the right end of the auditorium. Some were moving their hands about mimicking the person on stage. When the pastor delivered his sermon, a different person came on stage and moved his hands about to convey the sermon visually to the audience. My mum also took me to MHI’s SEE-II classes to pick up sign language. As a result, I believed that SEE-II was real sign language and that sign language was merely about signing each word in an English sentence. I learned how to sign the alphabet and picked up some basic signs. I also attended MHI events. Still, I had very little interest in signing and mixing with other people that wore hearing aids like me. After 6 months of attending the church, I lost interest altogether and left. My exposure to SEE-II under the church ministry was a result of developments in Deaf education in Singapore since the 1950s. It all started when Mr Peng Tsu Ying, who moved from Shanghai to Singapore, established a small deaf school in his home in the 1950s and introduced Shanghainese Sign Language (SSL) as the language of instruction. 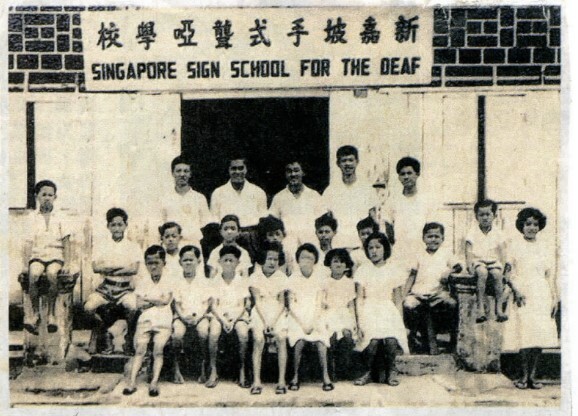 In 1963, the Red Cross Society’s oral deaf school, which taught deaf children to lip read and orally articulate words merged with Mr Peng’s school to become the Singapore School for the Deaf (SSD). The school had an oral section and a Chinese Sign Section. As such, earlier generations of the Deaf in Singapore were educated in SSL. In the mid-1970s, Lim Chin Heng, former student at the SSD returned to Singapore after completing his undergraduate education at Gallaudet University in Washington D.C. He introduced the Total Communication (TC) philosophy, ASL and SEE-II to SSD. The shift towards SEE-II as the main mode in educating the deaf was also cemented with the visit of Frances Parson in 1976. Parsons was the global ambassador of TC from Gallaudet College. She trained educators of the deaf in Singapore to use TC, a combined method where sign and speech were used simultaneously (Signal, 2005). Lim subsequently went back to Gallaudet to pursue a Master in Education of the Hearing Impaired in the late 1970s. Consequently, Mr Peng decided to move away from SSL and implemented the use of the structured SEE-II that followed the rules and conventions of the English language, since English was Singapore’s main official written language. He arrived at this decision after observing that the signing of the deaf students were unstructured (Signal, 2005). Yet, even while SEE-II was adopted as the official language of instruction in SSD, and younger generations of Deaf and hard-of-hearing children grew up with it, the use of SEE-II has divided the community with some believing it to be effective for teaching literacy in English while others do not see it as a proper language. Some of the Deaf in Singapore have gravitated towards the use of SgSL, which they claim as the language of the Singapore Deaf Community. I used SEE-II only for a few months in my teens. The whole time I had an inherent bias that sign languages were inferior to spoken languages and that the ability to speak set me apart from other deaf people. To me, it was more important to learn to speak and integrate into the hearing-centric world that we live in. Subsequently, I expended much time and energy attempting to be “hearing” by trying to fit into academic and social contexts with hearing people in order to appear “normal”. As a result, such situations often became a source of stress and anxiety for me. However, I thought I simply had to try to listen harder or I needed a more powerful hearing aid. For many years the erroneous beliefs I held about myself, other deaf people and sign languages were so deeply embedded in my psyche that I lived in complete oblivion to Deaf culture and community. In short, I was an audist because of such views and attitudes ingrained in me. Audism, a term coined by Dr Tom Humphries in 1977, refers to the discrimination of deaf people based on their inability to speak and hear (Berke, 2018). It is the belief that the ability to hear and speak makes one superior to those that do not possess these abilities. When I graduated from the Singapore education system in 2002, I decided that I wanted to become a teacher of the Deaf. I chose to go to Australia to start a one-year foundation studies program to prepare for entry to university. In 2004, when I commenced my undergraduate degree at Griffith University, I contacted the Deaf Student Support Program (DSSP) to enquire about accessibility services. As I did not know Australian Sign Language (Auslan), I was provided with a laptop notetaker to sit next to me during lectures and tutorials so I could look at the screen and follow what the professor was saying in class. As I expressed a desire to be able to access Auslan interpreters later on, DSSP arranged for me to meet with a native Deaf signer for an hour weekly to learn Auslan. My progress in learning Auslan was excruciatingly slow because apart from that one hour of practice every week, I was mostly interacting with hearing people outside of university classes and I had no Deaf friends nor access to Deaf events. At that point, it didn’t occur to me to actively seek them out. I only wanted to learn some sign language as I believed it was good for me to have some sign support via an interpreter. I was still not convinced that sign languages were legitimate languages. After I picked up some basic Auslan, I was provided with interpreters in my lectures and tutorials. However, my brain kept trying to decipher signs in English grammatical word order while in fact Auslan was “grammatically incorrect” according to the rules of the English grammar. I made progress through interacting with Deaf people and hearing signers on campus. However, I still associated Auslan with “broken English”. In 2007, the final year of my undergraduate program and taking specialized courses in Deaf education, I developed an understanding of Deaf culture and started to explore what it meant to be Deaf, as well as a deeper understanding of the grammatical structure of Auslan. The word BALL in each of the 3 sentences was signed differently. It was signed in a way that made sense visually and was conceptually accurate. Selected readings from Johnston and Schembri’s (2007) Australian Sign Language: An introduction to sign language linguistics also gave me a better understanding of how Auslan functions as a language. I realized that Auslan was a bona fide language with its own distinct grammar and structure. It was not “broken English” nor was it an “incomplete language” as I had previously thought, and could enhance reading comprehension. It dawned on me that SEE-II was conceptually inaccurate as the same sign was often used to represent a word even when that same word had different meanings in different contexts. Therefore, SEE-II did not make any sense at all visually. It is not real sign language but rather just an exact representation of the English language. The usage of SEE-II in reading can hinder comprehension of the text and result in miscommunication. In addition, after watching a set of Deaf History videotapes, I understood more deeply what Deaf Culture was. Being deaf is not a disability and deaf people including myself are not “disabled”. I realised that the term “hearing impaired” indicates a defect and implies that something is wrong with the person with hearing loss. The word ‘deaf’ is a pathological term. On the other hand, ‘Deaf’ represents a distinct cultural minority with its own norms. In other words, I was becoming Deaf. With my acquisition of Auslan and interaction with the Deaf community, I could become part of the community. I had a desire to discover more about the Australian Deaf Community. I started attending the Auslan Club organized by Deaf Services Queensland and volunteered at the Australian Deaf Games in January 2008. At the Deaf Games, I ended up chatting with hearing interpreters or hearing volunteers wanting an opportunity to practice their Auslan. I did get the opportunity to have brief conversations with a few Deaf people but felt somewhat out of place as they seemed to mingle with their white Australian friends or people they already knew. I felt inferior to local Deaf signers as I couldn’t sign or understand Auslan fluently. I still adopted the practices of “hearing” culture in some ways and used my voice at times because I had grown up oral. When I eventually shared with a Deaf friend that it was challenging to fit in with the Deaf community, her response was “You are not deaf enough”. So even as I had close friends who are Deaf and my Auslan improved, I had difficulty assimilating into the Australian Deaf community. I felt that as an Asian foreigner and oral deaf who learnt Auslan as a second language as an adult, I struggled to find my place and sense of belonging in Australian Deaf culture. I wondered if I had grown up being Deaf in Singapore, rather than rejecting my Deaf identity, would I have been able to develop a stronger sense of self and be more resilient? Would I not have tried so hard to fit in with hearing people all the time? Much to my surprise, I soon discovered that my initial fears were unfounded. It was at Gallaudet that I finally found acceptance as well as the freedom to be myself. I was enthralled by the diversity at Gallaudet. There were Deaf, Deafblind and hearing American as well as international students from all over the world, each with their own sign language – Korean, Japanese, Chinese, Omani and many others. I had expected discussions at Gallaudet to center on the lived experiences of d/Deaf and Deaf identity, but it turned out that there were so many other aspects to consider and reflect on. At Gallaudet, I was introduced to the term “intersectionality”, coined by Kimberlé Crenshaw. Intersectionality refers to how the many social categories such as race, gender, class, religion, sexuality, disability, and so on, that constitute the individual or group, are interconnected and overlap (Crenshaw, 2016). In other words, each person or group consist of multiple overlapping identities which are intricately interwoven. From an intersectional lens, we can identify how dynamics of oppression and power such as racism, sexism, classism, audism, etc. are created; how power structures marginalize individuals and groups in society. By adopting an intersectional lens, I began to understand why I never quite found my place in the Australian Deaf Community, which is predominantly white. This new-found understanding compelled me to critically examine other identities that I held. I identify as not only Deaf and/or Hard-of-Hearing but as a woman, a Southeast Asian, a Christian, Chinese-Singaporean, cisgender, English-speaking, oral, and from a hearing family. To discuss and define myself as only a Deaf person is to deny my personhood. My eyes were opened to the rich diversity prevalent within individuals and Deaf communities around the world. As part of the Chinese race, I am a member of the majority, and I am all too aware of having “Chinese privilege” in Singapore. I had experienced some degree of discrimination in Singapore on account of my perceived hearing disability. However, my experience would differ from those of non-Chinese d/Deaf individuals in multi-racial Singapore. It is how powerful groups in society construct normalcy and disability that disables me and portrays me as “disabled”. I grew up learning that signing was ‘not normal’ and that the ‘normal’ was to integrate with hearing people and to be able to speak and hear. However, at Gallaudet, I felt “normal” to be able to communicate in sign language. To not know sign language was “not normal”. Accessibility such as voice interpreters for events on the Gallaudet campus was provided for the “signing impaired”, not the “hearing impaired”. When we had a hearing presenter that didn’t know ASL, interpreters were provided for the audience so that they could have access to the presentation in ASL. had thought I had learned everything there was to learn about being Deaf when I was in Australia. The discussions at Gallaudet helped me to realize that it was only the tip of the ice-berg. In fact, every Deaf person in the world would have a different lived experience even though we all share one thing in common – a Deaf identity. I also came to learn through reading about Deaf and hard-of-hearing identity labels and through interaction with other Deaf and hard-of-hearing people at Gallaudet, that the term “hard-of-hearing” can be fluid. A friend said to me that she was proud to identify as hard-of-hearing because it meant that she is able to fit in both the Deaf and the hearing cultures with her ability to sign as well as speak. She could simply adjust her language modality to suit the social context. I had identified as Deaf when I learned Auslan. At the time, I thought that the label “hard-of-hearing” was neither here nor there; neither part of the signing Deaf Community nor part of the hearing community. I realized from my friend’s statement that I could identify as both Deaf and hard-of-hearing, and have done so. To me, “Deafhood”, a term coined by Paddy Ladd in 1993, refers to having a deep insight into one’s personal journey toward becoming Deaf. In this journey, one experiences identity shifting and learns how sign language and Deaf culture are intricately linked. It is about understanding my own lived experience as a Deaf person as well as those of other Deaf individuals. It is about understanding the dynamics of oppression and how marginalization of Deaf people as a linguistic minority occurs due to the operations of power structures in society that do not give them a voice. It is about how I have come to terms with my past and my healing from painful encounters as I journey towards becoming Deaf. It is also about understanding that every Deaf individual is on his or her own unique journey and is at different points in his or her life. When the Deaf individual embraces his or her Deaf identity and sign language, he or she can truly blossom as an individual and express himself/herself fully. Rather than see deafness or hearing loss as a problem to be cured, we need to understand that sign language has many benefits and embrace the concept of “Deaf Gain”. Deaf Gain focuses on how Deaf people and sign languages bring many benefits to Deaf people and also the world at large (Bauman & Murray, 2014). It posits that the world is actually a better place because of Deaf people and sign languages than it would be without them. Full access to sign language from birth enables deaf babies without other disabilities to acquire typical language developmental milestones like their hearing peers (Petitto, n.d.). Such accessibility enables the Deaf to achieve their full potential and pursue careers in all kinds of fields. Sign language empowers Deaf people and promotes equality. My journey leading to the embracing of my Deaf identity, acquiring different sign languages and studying linguistics has led me to conclude that exposure to SgSL for Deaf children in Singapore in the early years is crucial for their language and Deaf identity development, and their resilience. However, the SgSL versus SEE-II debate at the Deaf youth camp in 2016 which I introduced at the start of this essay points to the polarization between the different groups on the issue. While the Deaf in Australia and the USA are proud of Auslan and ASL respectively, the presence of various camps has meant that language issues in Singapore are more sensitive and delicate. There are d/Deaf individuals who are not convinced about the legitimacy of SgSL and there are those who support SgSL. There also appears to be confusion about what SgSL is. Most of us went through oralism when we were in school, and we do not have the experience of earlier generations of signers to build on. Consequently, there is still a lack of Deaf empowerment and awareness. I realize it is also important to reflect on how changes in the Deaf community in the USA have impacted Deaf and hard-of-hearing individuals in Singapore and the current state of Deaf education. One such event is the Deaf President Now protests of 1988 at Gallaudet University which resulted in the appointment of the university’s first Deaf president (Gallaudet University, n.d.). The protests led to greater activism and recognition of Deaf Culture and ASL, and the phasing out of SEE-II as the mode of instruction. Lim Chin Heng, who first introduced SEE-II to Singapore, was educated at Gallaudet in the 1970s before the DPN protests and when SEE-II was used widely. In contrast, I experienced Gallaudet in the post-DPN era and Deaf Education has undergone major changes since, notably with the implementation of ASL-bilingual methods. In the light of current debates between SgSL and SEE-II in Singapore, I wonder how such lived experiences of Gallaudet will also influence the directions activism over language issues for Deaf people in Singapore will take. At the same time, I am also highly conscious of how much of my views I can project when interacting with Deaf and hard-of-hearing individuals in Singapore. I have been away from home for the last 15 years or so, and often wonder if it is my place to comment or get involved in the SEE-II and the SgSL debate. Would I be influencing the local context with western centric views? However, there are misconceptions about language that need to be addressed. I do very much feel a sense of responsibility to give voice to issues pertaining to Deaf people and sign language, and want to make a contribution to my country where I can. In balancing my hope to share and the concerns of the various groups in the community, it feels as if I am walking on a tightrope at times. As I navigate this path in the future, I do hope that Deaf and hard-of-hearing Singaporeans will have the opportunity to learn about the grammatical structures of SgSL and come to a deeper understanding of our own language and how it functions. I also hope that more Deaf and hard-of-hearing Singaporeans will have opportunities to develop their Deaf identity and a sense of empowerment. Last but not least, I hope to see future generations of Deaf children become strong advocates for the Deaf community, and for a Singapore that allows for full and equal participation of all its citizens. Phoebe Tay is a Gallaudet alumni who graduated in 2017 with a MA in International Development and a MA in Linguistics. Prior to that, she worked as an educator of the deaf in Australia. She is currently working for the Deaf Bible Society as a Linguistic Research Specialist under their Institute of Sign Language Engagement and Training (ISLET). She hopes to be able to contribute to the Deaf community in Singapore in the future. **NOTE: The following dialogue has been translated directly from SgSL/SEE-II to English. SgSL structure differs from English structure. The contents are based on the author’s notes and memory of the event in 2016. Johnston, T., & Schembri, A. (2007). Australian sign language: An introduction to sign language linguistics. Cambridge: University Press. Ladd, P. (2003). Understanding deaf culture: In search of deafhood. Clevedon: Multilingual Matters. Myers, S. S., & Fernandes, J. K. (2010). Deaf studies: A critique of the predominant U.S theoretical direction. The Journal of Deaf Studies and Deaf Education, 15(1), 30-49. Signal. (2005). Editorial. Singapore: The Singapore Association for the Deaf. Feelings about Deaf , hearing impaired and Signs & Deaf languages & signages. An honest story of how one person struggled to find her identity. Disability or handicap are not discriminatory. They are factual statements of reality, and everyone has one or more. For a child who was born with hard of hearing, very much depends on how adults, especially parents, accept the child “as is”. We help every child / person to acquire a meaningful identity when we communicate unconditional acceptance of the person “as is”.